Is réigiún i dtuaisceart fho-ilchríoch na hIndia san Áise í an Chaismír. Ón mbliain 1947 anuas, tá úinéireacht na Caismíre ina cnámh spairne idir an India, an Phacastáin agus Daon-Phoblacht na Síne. Tá codanna den réigiún faoi rialú na dtrí náisiún úd, mar atá, Jammu agus an Chaismír faoi smacht na hIndia, Azad Kashmir agus Gilgit-Baltistan faoi smacht na Pacastáine agus Aksai Chin agus an Limistéar Tras-Karakorum faoi smacht Dhaon-Phoblacht na Síne. Insan chéad leath den chéad mhílaois, d'éirigh an Chaismír ina ionad tábhachtach don Hiondúchas agus ní ba dhéanaí don Bhúdachas; ní ba dhéanaí fós, sa 9ú haois, tháinig an creideamh úd Seaghvachas na Caismíre ar an saol. Sa bhliain 1339, tháinig Shah Mir i réim mar an chéad rialtóir Muslamach ar an gCaismír, tús an Salatin-i-Kashmir (rí-theaghlach Shah Miri nó Swati). Bhí an Chaismír ina cuid de Impireacht na Mughal ó 1586 go 1751, agus ansin go dtí 1820, de Impireacht Afgánach na Durrani. ↑ "Kashmir: region, Indian subcontinent". Encyclopædia Britannica. Quote: "Kashmir, region of the northwestern Indian subcontinent. It is bounded by the Uygur Autonomous Region of Xinjiang to the northeast and the Tibet Autonomous Region to the east (both parts of China), by the Indian states of Himachal Pradesh and Punjab to the south, by Pakistan to the west, and by Afghanistan to the northwest. The northern and western portions are administered by Pakistan and comprise three areas: Azad Kashmir, Gilgit, and Baltistan, ... The southern and southeastern portions constitute the Indian state of Jammu and Kashmir. The Indian- and Pakistani-administered portions are divided by a “line of control” agreed to in 1972, although neither country recognizes it as an international boundary. In addition, China became active in the eastern area of Kashmir in the 1950s and since 1962 has controlled the northeastern part of Ladakh (the easternmost portion of the region)." ↑ "Kashmir territories profile". BBC. Quote: "The Himalayan region of Kashmir has been a flashpoint between India and Pakistan for over six decades. Since India's partition and the creation of Pakistan in 1947, the nuclear-armed neighbours have fought three wars over the Muslim-majority territory, which both claim in full but control in part. Today it remains one of the most militarised zones in the world. China administers parts of the territory." ↑ "Kashmir profile — timeline". BBC. 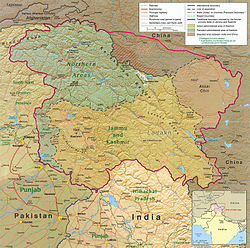 Quote: "1950s – China gradually occupies eastern Kashmir (Aksai Chin). 1962 – China defeats India in a short war for control of Aksai Chin. 1963 – Pakistan cedes the Trans-Karakoram Tract of Kashmir to China." ↑ Basham, A. L. (2005) The wonder that was India, Picador. lgh. 572. ISBN 0-330-43909-X, lch. 110. ↑ Imperial Gazetteer of India, volume 15. 1908. Oxford University Press, Oxford and London. lgh. 93–95. Tugadh an leathanach seo cothrom le dáta an 31 Márta 2017 ag 04:32.